Sherry Finzer is an international award-winning American flutist and composer. Based in Phoenix, AZ, she performs as a soloist, with her guitarist Darin Mahoney, Native American flutist Mark Holland, Australian pianist Fiona Joy, and other local, national and international musicians. Recently, she has been playing with seven time Grammy® nominee Will Clipman, and she, Will, and Darin Mahoney have just released an album, Trialogue. She is known for her variety of musical styles, and she travels nationally and internationally to perform as a Pearl Flute Performing Artist, Guo Flute Performing Artist, and Recording Artist for Heart Dance Records. Musically, Finzer has evolved from a classical, competitive flutist to recording acclaimed New Age music albums. Recently, Sherry won the Zone Music Reporter award, Best Relaxation/Meditation Album of the Year, for her album, Flute Flight, a collaboration with Native American flutist Mark Holland. Fresh off the win in New Orleans, Sherry graciously granted us an interview. Sherry’s sound is influenced by the different genres of music she plays, by the artists she collaborates with, and by the flutes she uses. She uses various types of flutes to create her pieces, where the sounds of wind instruments are mixed with Gregorian chants, ethereal sounds, and other ethnic instruments to create a relaxing experience. Finzer performed onstage with Clay Aiken at one of his Joyful Noise concerts, and has performed with Windham Hill artist Scott Cossu and Aussie classical pianist Fiona Joy. For her contributions to the genre of flute music, she was a semi-finalist for a Grammy® award nomination in 2010, 2012 and 2013. Her solo albums are available as a CD or as digital downloads, and can be purchased at a variety of online music sales sites including CDBaby, Amazon, and iTunes.Sherry’s music can be heard on Echoes on NPR, where “Sanctuary III: Beyond the Dream” was selected CD of the Month for January 2015. Her music is also played on the Sirius/XM Spa Channel, CBC-Galaxie, Soundscapes Channel on Music Choice, Qantas and Asian Airlines, Pandora, One World Music, and more. Sherry is a voting member of the National Academy of Recording Arts and Sciences(GRAMMY), ASCAP, NARAS, the National Flute Association and the AZ Flute Society, and the World Flute Assoc. You can listen to the Echoes John Diliberto’s interview of Sherry Finzer here. Sherry is a member of the National Arts and Recording Academy (NARAS), ASCAP, the National Association of Record Industry Professionals (NARIP), the National Flute Association, AZ Flute Society and is founder and president of the AZ World Music Initiative (AZWMI). Buy these and more Sherry Finzer CDs at CD Baby or visit Sherry’s website. Contact Sherry for more information, to book a performance, radio promotion, or for music licensing. 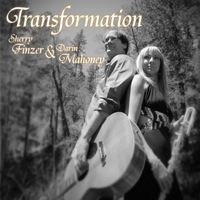 TRANSFORMATION: Guitarist Darin Mahoney and flutist Sherry Finzer created Transformation with the intention to help others, whether it be a stressful event, and illness, or just the need for relaxation. The songs are quite emotional, as Darin shares his story of surviving Stage 4 cancer through his music. Alger St and Joplin recreate memories from Darin’s childhood, The Door is about opportunities that are presented to us throughout our life, and how we choose the doors that make up our lives. Confused conjures up feelings about Darin’s experience after waking up from his coma after his chemotherapy treatments, and Jane’s Song was written for violist Jane Hilton, who dealt with and successfully battled breast cancer. Reflection stirs up tender memories for Sherry of her love and devotion to her children. The melancholy melody of White Sky in November was dedicated to Sherry by composer Tom Febonio. Darin’s composition of Early Spring is about the renewal and awakening after going through a major Transformation in life. Alger St., Confused, Early Spring, Joplin, Jane’s Song and The Door were written by Darin Mahoney (BMI). Reflection was written by Sherry Finzer (ASCAP), and White Sky in November by Tom Febonio (ASCAP). Transformation was recorded, mixed and mastered by John Herrera at Clamsville Studios. Sherry Finzer is an international award-winning American flutist and composer. Based in Phoenix, AZ, she performs as a soloist, with her guitarist Darin Mahoney, Native American flutist Mark Holland, Australian pianist Fiona Joy, and other local, national and international musicians. She is known for her variety of musical styles, and she travels nationally and internationally to perform as a Pearl Flute Performing Artist, Guo Flute Performing Artist, and Recording Artist for Heart Dance Records. Musically, Finzer has evolved from a classical, competitive flutist to recording acclaimed New Age music albums. Altogether she has recorded 11 CD’s, her latest, Sanctuary III: Beyond the Dream. Last year’s collaboration with guitarist Darin Mahoney won One World Music Best Album of 2013. Finzer recently performed onstage with Clay Aiken at one of his Joyful Noise concerts, and has performed with Windham Hill Artist Scott Cossu and Aussie artist Fiona Joy. For her contributions to the genre of flute music, she was a semi-finalist for a Grammy award nomination in 2010, 2012 and 2013. In addition to her work as an artist, Finzer is also the founder and president of the local non-profit Arizona World Music Initiative, and offers private lessons at her studio in Phoenix. In 2014, Sherry became a member of Fiona Joy’s Blue Dream Ensemble, which tours internationally. Her solo albums Sanctuary, Sanctuary II: Earth, Sanctuary III: Beyond the Dream, Transformation, Desert Journey, Someone like Me, Masquerade and Radiant Sky are available as a CD or as digital downloads, and can be purchased at a variety of online music sales sites including CDBaby, Amazon, and iTunes. Sherry’s music can be heard on Echoes on NPR, where “Sanctuary III: Beyond the Dream” was selected CD of the Month for January 2015. Her music is also played on the Sirius/XM Spa Channel, CBC-Galaxie, Soundscapes Channel on Music Choice, Qantas and Asian Airlines, Pandora, One World Music, and more. Her new CD, “Flute Flight,” with Mark Holland will be released in 2015. Crossing Boundaries is an archived monthly show heard on One World Music. Contact Sherry for more information, to book a performance, or for music licensing.